According to the European Southern Observatory’s announcement, the three planets exist inside Gliese 667C’s habitable zone, the region that is neither too hot nor too cold to sustain liquid water, meaning that the planets may be capable of supporting alien life. As super-Earths, the Gliese 667C planets are all larger than Earth, but smaller than Neptune. The findings are set to be published in the journal Astronomy & Astrophysics. Gliese 667C is a star with only about a third of our sun’s mass, with five to seven planets orbiting it, including the three habitable super-Earths, Space.com reports. 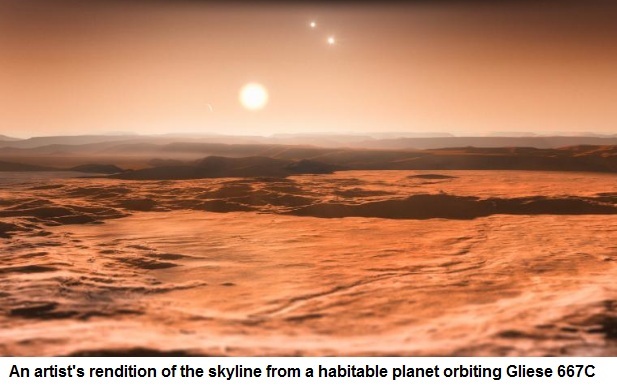 Because Gliese 667C is part of a three-star system, any life forms that exist on the habitable planets may be able to see three suns at once when they look up to the sky. Due to the star’s small size, its habitable zone is very close to the star itself, unlike our sun, which supports life much farther out. Most importantly, though, is that Gliese 667C is extremely close to Earth, by space standards. The star is located about 22 light years away, inside the constellation Scorpius. That distance, 132 trillion miles, might seem a long way, but on an astronomical scale, Gliese 667C and Earth are practically next-door neighbors. It’s still a long time before we would be able to send any probes towards the star or its planets, but if that technology ever comes, this means that Gliese 667C may be the first place we attempt to either colonize or greet alien life. In order to find Gliese 667C and its three habitable planets, the astronomers pooled data from several high-powered telescopes around the world, utilizing a technique called radial velocity. The researchers studied the slight gravitational effects that the planets produced as they revolved around Gliese 667C and determined their characteristics from there.